Mountain biking has always been about having fun out on the trails and pushing limits. Devinci has been making quality bikes since 1987 and continues to make quality Canadian-made bikes to this day. The Devinci Spartan mountain bike rolls on 27.5" wheels and has 170mm of travel in the front and 165mm of travel in the rear making it a highly versatile machine. The bike is built on an Aluminum Optium G04 frame that has low stand-over height and a reinforced skid plate. The frame uses a Split Pivot Suspension System that separates acceleration forces from braking forces. With 2.6" max tire clearance, this bike becomes highly versatile, ready to go anywhere. 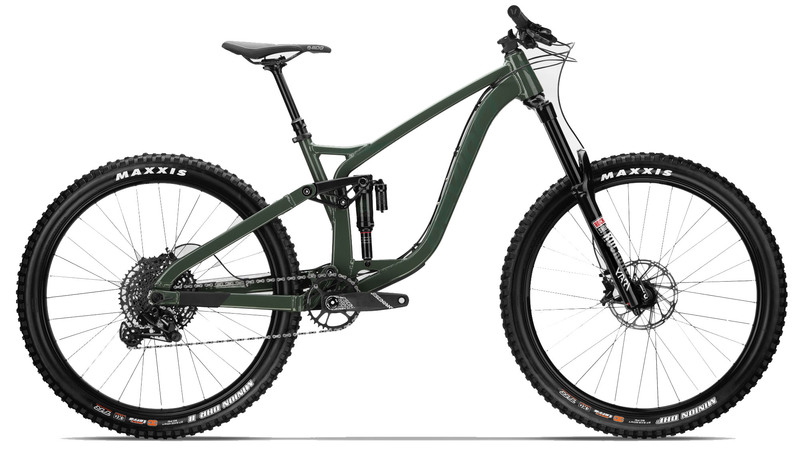 This version of the Devinci Spartan Carbon comes with a SRAM NX Eagle 12-speed shifter, rear derailleur, crankset, and chain. SRAM's NX Eagle drivetrain provides a wide 10-50 tooth gear range that is perfect for all terrain. It features a RockShox Yari RC fork with 170mm of travel and a RockShox Super Deluxe R rear shock. When you're coming down the mountain, the SRAM Guide T hydraulic disc brakes provide the stopping power needed for those long descents. The TranzX dropper post provides a seamless transition between climbing and descending. With V2 Comp wheels and Maxxis Minion tires, you'll have a tubeless ready setup for lower tire pressures, fewer puncture flats, and increased traction.